Yay or nay? MPs dressed to the nines - mostly - for the State of the Nation Address on Thursday evening. Cyril Ramaphosa's State of the Nation Address (SONA) received a lot of praise from analysts, but the same can't be said about the outfits some of the country's MPs wore on the red carpet. From revealing dresses to strange eyewear, the SONA red carpet provided more misses than hits. Take a look at some of the best and worst looks. Lillian Wolmarans, the wife of ANC MP Matthews Wolmarans, turned heads for all the wrong reasons on the red carpet. Her dress was deemed inappropriate by social media users. 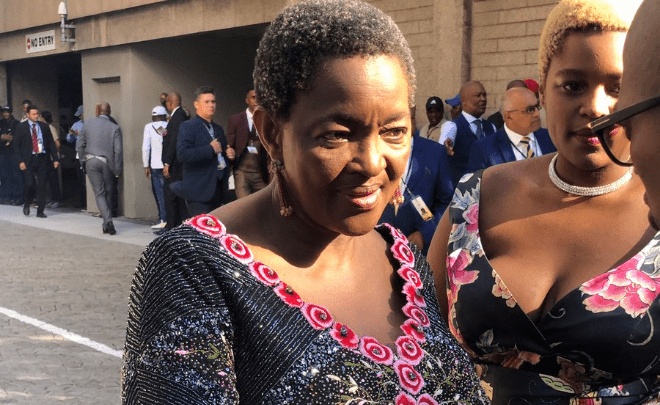 Bathabile Dlamini's red carpet appearance left many people scratching their heads in confusion. Not only was her dress panned, but her interview with a reporter was an epic fail as well. When asked who designed her dress, the minister started blabbing about things that were unrelated to the question. We still don't know who designed her look, but maybe it is a good thing we don't! South Africa is known for its rich cultures, but many SONA viewers were surprised by one MP's look. She paired her traditional outfit with, um, interesting looking glasses. Patricia's look was simple and, dare we say, boring. Nomvula's coral dress was a miss thanks to the weird flowers she had "growing" out of it! Kgethi Phakeng stunned in a full-length skirt and print top. Mmusi Maimane's wife Natalie was a vision in white. Her asymmetrical jumpsuit was a red-carpet winner. The future First Lady and the President look very beautiful. The DA’s Phumzile van Damme's look was young and hip. ANC MP Omie Singh and his wife Popsi like to keep things traditional for their SONA red carpet looks and this year was no different. Siobhan Swart, the daughter of ACDP MP Steven Swart, received lukewarm ratings from social media users. We think it looked great!